Time for a new MateBook upgrade! After the announcement of the new MateBook 13 during CES 2019, it's now time for the big boys - the MateBook X Pro and MateBook 14. 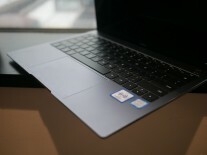 While the MateBook X is just a hardware refresh of its predecessor of some sort, the MateBook 14 is actually a new addition to the MateBook family. The latter focuses on performance while missing on some features to keep the price more bearable. Let's begin with the MateBook X Pro. The design remains untouched. The weight and dimensions are the same but the laptop packs some cool improvements under the hood. We've got the latest generation CPU from Intel running the show and an Nvidia GPU doing the heavy lifting. 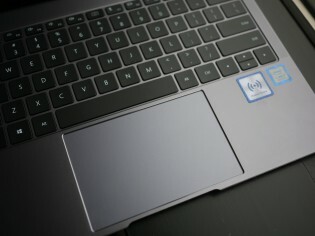 To be more exact, the MateBook X Pro utilizes Intel's brand new Core i7-8565U and Core i5-8265U chips offering slightly higher clock speeds and promise some power efficiency gains too. The discrete GPU on board has been bumped up as well - from GeForce MX150 with 2GB of GDDR5 VRAM to GeForce MX 250 with 2GB of GDDR5 VRAM. Memory options are 8GB and 16GB and storage is 512GB or 1TB provided by a PCIe NVMe SSD. The 13.9-inch IPS display with an unconventional 3000 x 2000 pixels resolution is still at hand offering peak brightness of 450 nits, 100% sRGB color gamut coverage and 1500:1 contrast ratio. 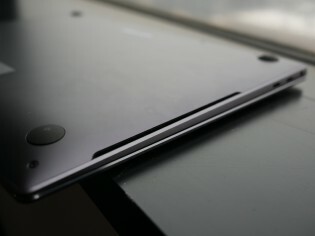 Still a touch panel, though, and bezels are impressively thin. 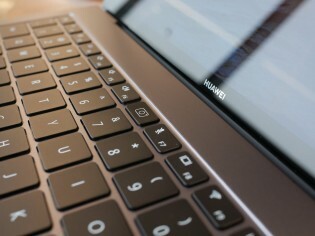 The 57.4Wh battery keeps the lights on, but Huawei promises a bit longer battery life than before due to the improved hardware. The fingerprint reader is still in there for extra security. Unfortunately, the webcam is still 1MP, which is a real bummer in 2019. Bigger sensors aren't all that expensive although, this might be due to the limitations of the pop-up mechanism. But on the other hand, connectivity continues to be one of the strong suits for the X Pro - 1x USB-C Thunderbolt 3 connector, 2x standard USB-C (probably 3.1 Gen 1) and 1x regular USB-A 3.0. This Huawei's MWC announcement event marks the global release of the product while the US will get it sometime in May this year. And as for pricing, the Core i5 config with 8GB of RAM and 512GB storage asks €1,599 while the beefed-up model with Core i7, 16GB of RAM and 1TB of SSD will go for €1,999. Both variants ship with a touch panel. 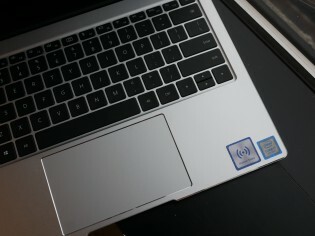 The MateBook 14 is supposed the fill the gap between the X and the D. It delivers high-end performance hardware without costing as much as the X model. Still pretty light, though - 1.49kg. It has a lower resolution (2160 x 1440) with 3:2 aspect ratio touch IPS display (only for the Core i7 configuration) reaching a peak brightness of 300 nits and still manages to cover 100% of the sRGB color space and deliver 1000:1 contrast. The basics are covered. Cool new feature like the screenshot gesture and Eye comfort mode are available but begs the question why you'd need the latter since Windows 10 already offers that. 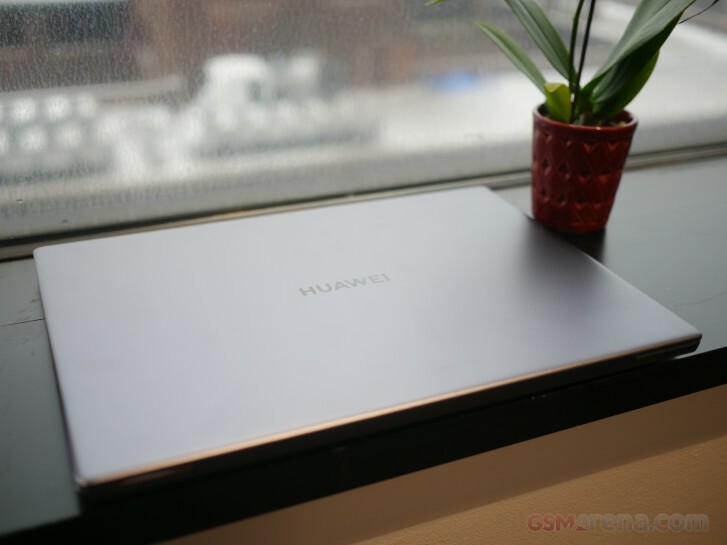 Also, the push for slimmer bezels have forced Huawei to move the webcam somewhere else. 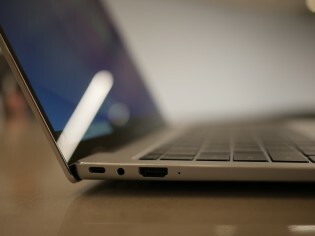 What better place to place it under one of the keys on the F row like on the MateBook X Pro? 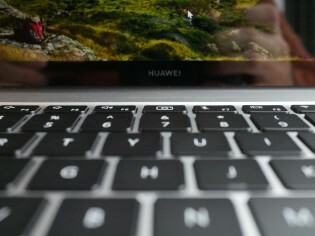 When needed, the camera pops up and it feels like a small trade-off given the impressive 90% screen-to-body ratio, especially for people not using the webcam all that often. 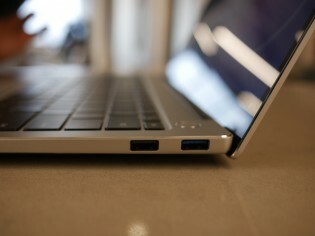 And it carries some security benefits as well - no more taping your webcam when not in use. 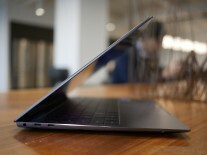 As we already mentioned, the laptop is just as powerful as the MateBook X Pro, minus some features. 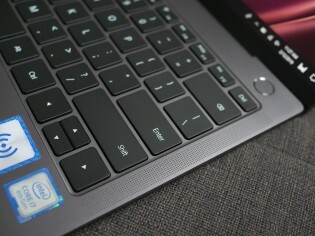 It adopts Intel's latest Whiskey Lake family CPUs and can go up to Core i7-85650U paired with Nvidia's GeForce MX250 with 2GB GDDR5 of memory. Speaking of memory, the configurations are the same as on the MateBook X Pro - up to 512GB PCIe NVMe SSD and 16GB of RAM. A Shark Fin 2.0 fan design allows for 18% better cool air intake. Other cool features include a fingerprint reader, latest WiFi and Bluetooth 5 support and Atmos-calibrated loudspeakers for a complete multimedia experience. Connectivity isn't overlooked either. 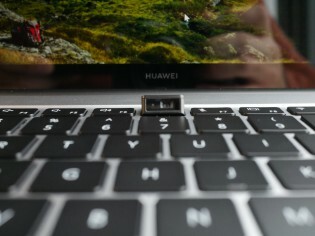 There are two standard USB-A connectors - one USB-A 2.0 and one USB-A 3.0. The third USB is of the USB-C kind but isn't Thunderbolt 3-compliant. However, it still supports DisplayPort and charging and combined with the full-sized HDMI, which can be found on the left side right next to the 3.5mm audio jack, it can support up to two external displays. 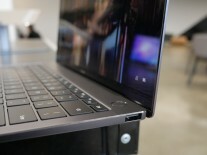 But since the notebook charges over the said USB-C connector, you can't charge it and use two monitors at the same time. 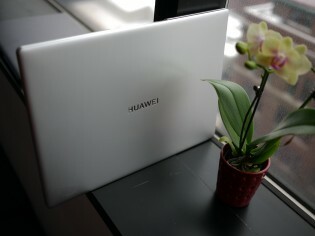 Battery capacity is the same as on the X Pro - 57.4Wh and Huawei promises around 15 hours of non-stop video playback and the included 65W charging brick in the box can push 3 hours worth of energy in just 15 minutes. On contrary to the premium X Pro, this one comes in Pink Gold in addition to the standard Space Gray and Mystic Silver options. The pricing starts from €1,199 for the base Core i5 configuration with 8GB of RAM and 512GB SSD while the Core i7 variant will set you back €1,499 with 16GB of RAM, 512GB SSD and a touch panel.